Recorded with the production and mixing team of Flood (Depeche Mode, U2) and Alan Moulder (Smashing Pumpkins, Jesus and Mary Chain, Ride) and Belong unleashes added power, while retaining all the sweet sweet melodies that still hit that pop spot. “Alan Moulder and Flood had a lot to do with helping us believe in ourselves, but they didn’t try to change the way we did things,” says Berman. “They just helped us focus on the things that made us ‘us,’ and allowed us to go all-in on the things we loved and strip away the things we didn’t. It was an amazingly validating experience to even get a chance to work with them, since they came into this because they saw something in our music, not because we were some kind of fat paycheck or will win them a Grammy. Perhaps not, but The Pains of Being Pure at Heart have come a long way since their beginnings as drum-machine equipped neophytes playing a legendary 5 song, ten-minute set at Peggy’s birthday party in March of 2007. Belong’s strength is the quality of the songwriting and each songs ability to sound distinct from one another while still holding together as a unified record from start to finish. Some, like the fuzz-mad “Heaven’s Gonna Happen Now,” “Girl of 1,000 Dremas” and statuesque “Too Tough” wouldn’t sound out of place on their first LP, taking their cues from Berman’s plaintive voice and liberal use of fuzz guitar. Others, like “The Body” and “My Terrible Friend” derive their power from drummer Kurt Feldman’s pulsing rhythms and Peggy Wang’s more pronounced keyboard lines – a winning development that helps push the band beyond their comfort zones to great effect. 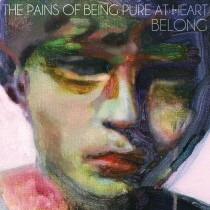 Berman might want to rethink that statement – With Belong, The Pains of Being Pure at Heart have created a piece of sonic bliss that fits – for the moment, and for the long-run.